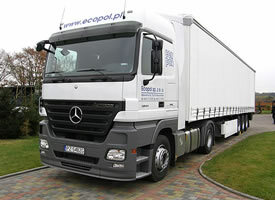 From the very beginning of its existence on the market, the company ECOPOL has offered transportation services. Throughout the initial period we have concentrated on transporting our own goods to the purchasers. With the course of time the needs of our customers kept on growing. In order to fulfill their expectations not only have we decided to set up business contact with various carriers, but also purchased in the year 2002 a delivery van Iveco Daily with loading capacity 3,85 tons and five-palette places. 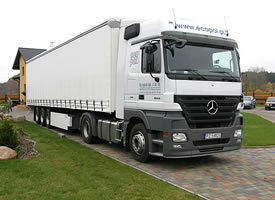 At present, apart from the above mentioned van, we have at our disposal a tilt trailer Mercedes Actros with a semitrailer Krone ProfiLiner: length 13.6 m; width 2.48 m; height 2.75 m, capacity 24T. All our cars are fully operating, equipped with GSM mobile phones, GPS satellite navigation and the possibility of a double - driver crew. Our company has 1.000.000 Euro OCP. We are constantly developing our transportation capabilities by means of new business contacts and the enlargement of our own fleet. 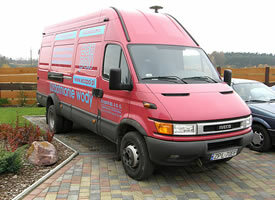 We operate throughout the whole territory of Poland and also Western Europe.